Considering the very attractive price I paid for this watch, I was prepared to be looking at a possible daily wearer. Imagine my surprise when I opened the box and found a very nice watch which looks as elegant as the ad pictures and looks robust enough to become an admired addition to my daily rotation of watches. It certainly looks like a watch that may cost many times the price I paid. Let me start by saying that the watch looks impeccable. The glass is very clear and the black dial is very attractive. It keeps the time very accurately. I was able to adjust the bracelet to my 7.25 inch, and it is very comfortable. So far everything is 5 stars. Why do I give it a total rating of 2? Here we go. The bezel, even though it is very attractive. it came stuck, it would not move in any direction. I thought it was stationary for a moment, but checking the specification it is supposed to be rotating in both directions. I decided to use brute force and a little bit of #5 virgin oil under the bezel. After a half hour of working it out I was able to turn the bezel. The bezel will not turn unless I remove the watch from my wrist and use both hands to turn it. This is to say that I have to use my finger nails (very strong nails) in order to rotate the bezel. This is very frustrating to say the least. The good side. If you don't care to move the bezel, I will give the watch a rating of 5. Have a great day! When I first saw this watch for sale I was impressed, and I'd never heard of this brand before. What really sealed the deal was the fact that it was priced originally for **** and had great reviews. Upon receiving it I was disappointed. Obviously it's not going to be a Rolex but I did expect the quality to be better. If you own nice watches you will most likely be dissappointed. The band is very cheap and actually sounds cheap when the links move. The bezel on mine does not move. Another big flaw for me is when the "second" hand ticks it doesn't line up with the "second" lines that go along the inner circle of the watch which just shows a lack of quality. The dots on the bezel don't line up the way they should between the numbers. And lastly, the magnifier over the date isn't centered over it, it's actually placed a little high and at a slight angle. So I'll wear it as a beater watch but that's about it. It may be designed in New York but this has China written all over it. It's a **** disguised as a ****. So hopefully this helps you make the decision whether to buy it. If you're not a watch collector and don't really care then this watch will work fine, but if you really pay attention to details and own nicer watches this isn't for you. It was a very cheep watch. Outer bezel would not turn, not very water tight. It broke on day one. One of the bracelet pins fell out and my jeweler couldn't even fix it. Luckily Overstock sent me a new one right away! Beautiful. I bought this watch for my eldest Grandson's 15th Birthday. He is growing into a wonderful and thoughtful young man and I wanted this watch to mark a "Rite of Passage" from child to young adult. Not only is it classy but it is built SOLID and heavy, waterproof meant something to me as well, being his is likes the outdoors, camping, fishing and is a Pitcher in his highschool's baseball team, so being a durable watch is a necessary for him. Definitely a special gift that I am sure he will treasure forever. Thank you for having it on sale so I could afford something this nice for my number one grandson. Very nice watch. Bought for a daily wearer but at when I recieved it, it looked too nice to wear to work. But I did and just decided to order another one for when not working. I am extremely happy with this watch. It is perfect for everyday use. The only thing I do not like is that the bezel does not move. Other than that I have no complaints! For the price I don't think you and beat SO&amp;CO. 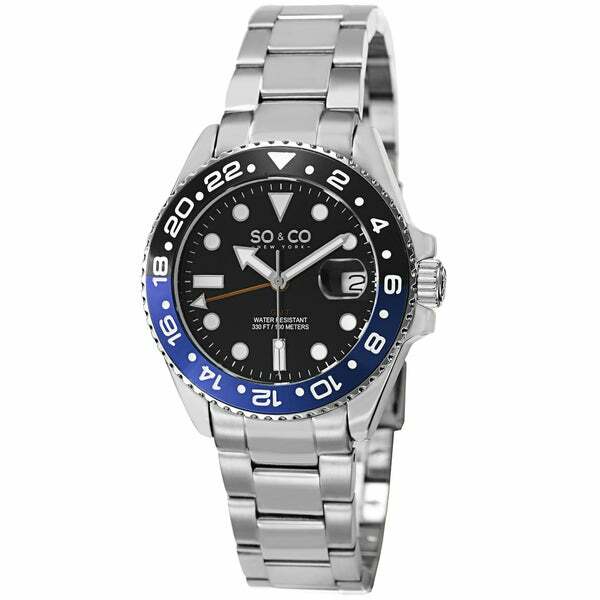 Outstanding GMT watch can’t go wrong with the price the looks and accuracy like others that costs thousands and awesome service from overstock! Keep up the great work!!! Handsome,rugged. Waterfront or night on the town ! Will look forward to wearing it at work and on date nights. Great watch for great value !!!! Unbelievable price !!!! "Does this watch actually have the GMT feature? It's pictured, however the description doesn't seem to fit the watch. It lists it as a female watch in the description..."
This does feature a GMT, however the title is incorrect we did indeed categorize this as women’s, However it is more of a “boyfriend” style women’s watch and can be worn by both, it is 40mm so it’s a fairly large case size.